The first part has been published here. The second part has been published here. Below, you will find the code for the third part: Text classification with lime. 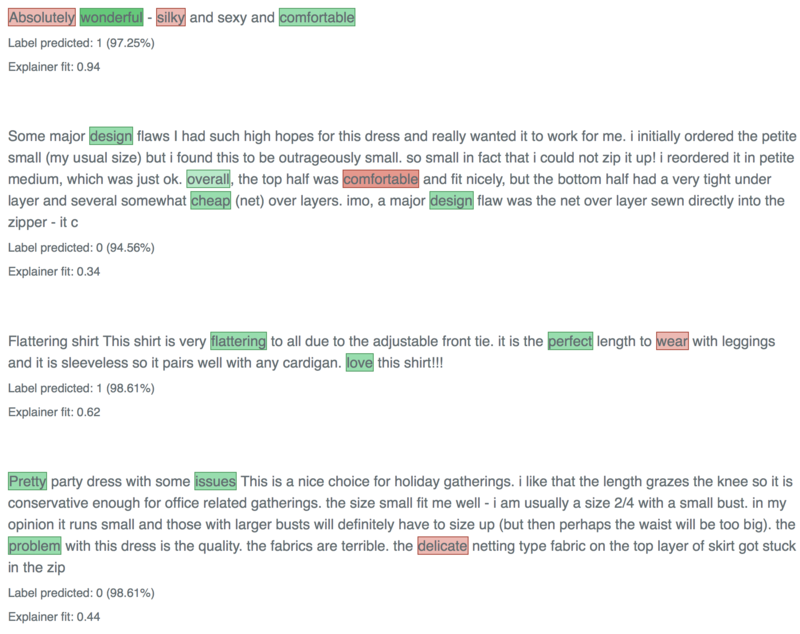 Here I am using another Kaggle dataset: Women’s e-commerce cloting reviews. 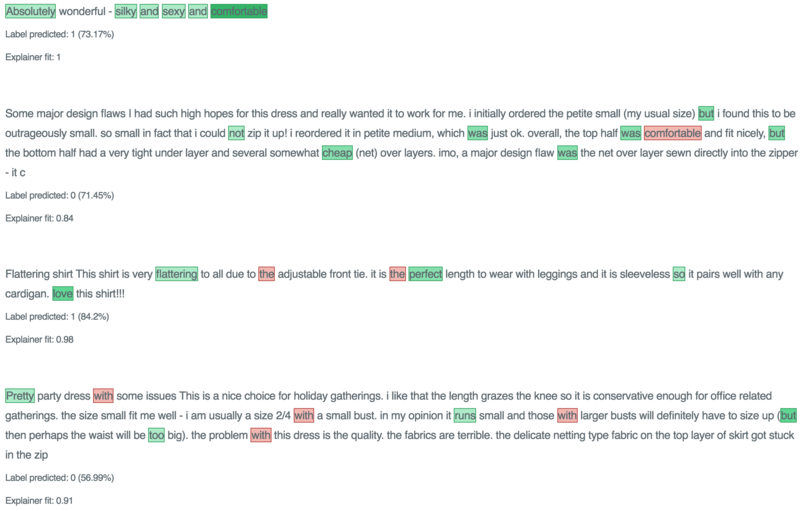 The data contains a text review of different items of clothing, as well as some additional information, like rating, division, etc. In this example, I will use the review title and text in order to classify whether or not the item was liked. 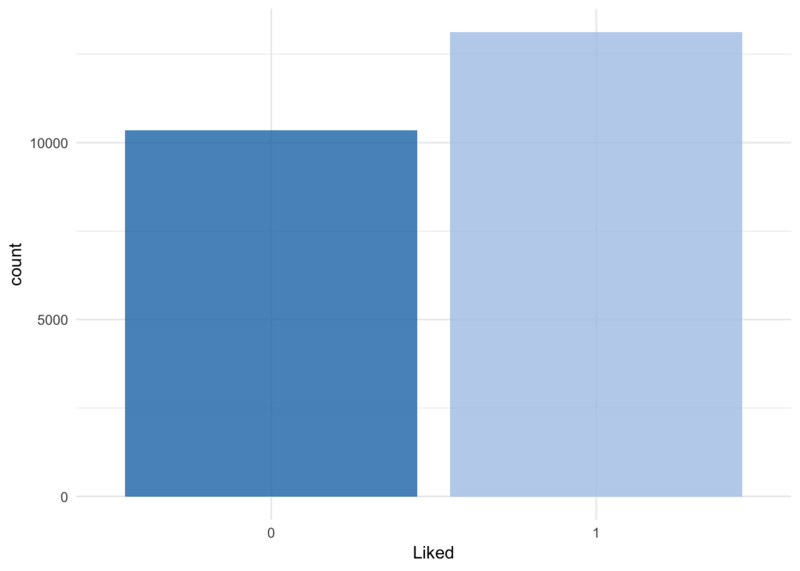 I am creating the response variable from the rating: every item rates with 5 stars is considered “liked” (1), the rest as “not liked” (0). I am also combining review title and text. Whether an item was liked or not will thus be my response variable or label for classification. The first text model I’m looking at has been built similarly to the example model in the help for lime::interactive_text_explanations(). First, we need to prepare the data for modeling: we will need to convert the text to a document term matrix (dtm). There are different ways to do this. One is be with the text2vec package. Alternatives to text2vec would be tm + SnowballC or you could work with the tidytext package. The itoken() function creates vocabularies (here stemmed words), from which we can create the dtm with the create_dtm() function. All preprocessing steps, starting from the raw text, need to be wrapped in a function that can then be pasted into the lime::lime() function; this is only necessary if you want to use your model with lime. Now, this preprocessing function can be applied to both training and test data. And we use it to train a model with the xgboost package (just as in the example of the lime package). We can plot them either with the plot_text_explanations() function, which gives an output like in the Shiny app or we use the regular plot_features() function. 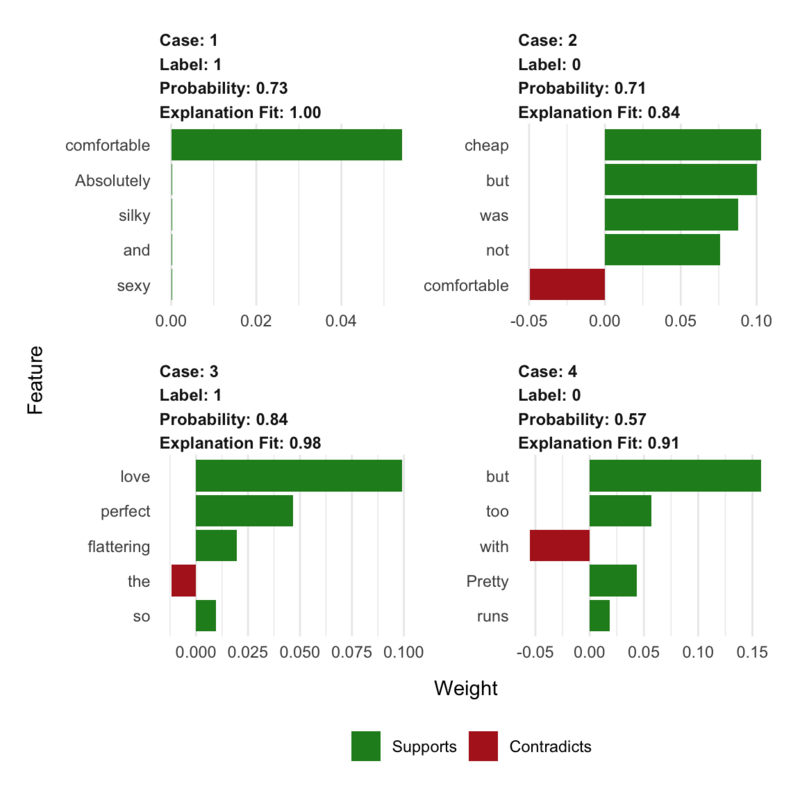 Okay, our model above works but there are still common words and stop words in our model that LIME picks up on. Ideally, we would want to remove them before modeling and keep only relevant words. This we can accomplish by using additional steps and options in our preprocessing function. Important to know is that whatever preprocessing we do with our text corpus, train and test data has to have the same features (i.e. words)! If we were to incorporate all the steps shown below into one function and call it separately on train and test data, we would end up with different words in our dtm and the predict() function won’t work any more. In the simple example above, it works because we have been using the hash_vectorizer(). Nevertheless, the lime::explain() function expects a preprocessing function that takes a character vector as input. This vector space can now be added to the preprocessing function, which we can then apply to both train and test data. Here, I am also transforming the word counts to tfidf values. The words that get picked up now make much more sense! So, even though making my model more complex didn’t improve “the numbers”, this second model is likely to be much better able to generalize to new reviews because it seems to pick up on words that make intuitive sense. 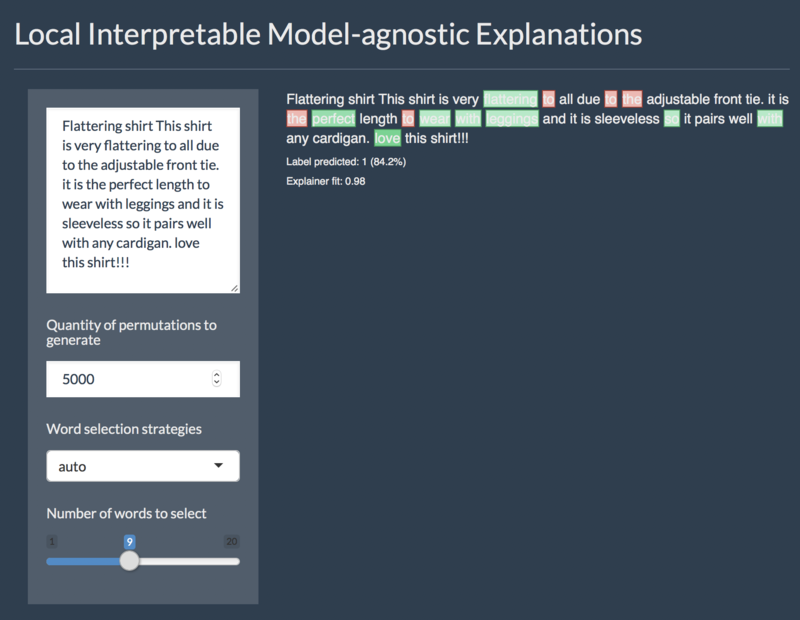 That’s why I’m sold on the benefits of adding explainer functions to most machine learning workflows - and why I love the lime package in R!